Infiniti’s Lane Departure Prevention (LDP) system is a camera-based technology which helps drivers return the vehicle to its travelling lane when an unintentional lane departure is likely. Images from a camera mounted at the top of the windscreen are continuously analysed to determine where the car is situated in relation to the lines which define the lane in which the car is travelling. If the driver has not used the turn indicators and the car is about to cross the lane marker, the system interprets the situation as a potential unintended lane departure. A warning signal illuminates in the dashboard and an audible signal is given. At the same time, a brake is applied very gently to the two wheels of the one side in order to help the driver to return the car to the centre of the travelling lane. 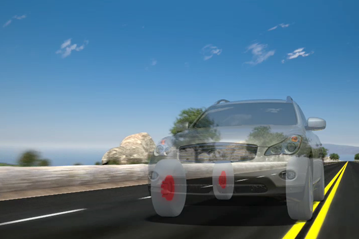 This brake control is very slight and is not intended to prevent the car from crossing the line; it assists the driver to keep the car in the intended lane and can be easily overcome, allowing the driver to remain in control of the vehicle at all times. If the driver responds, the brake control gradually stops. The system recognises most common types of lane markings - white and yellow, continuous and dashed – in daylight and at night and operates at speeds above 70km/h. At lower speeds, typical of urban driving, the system is disabled in order not to irritate or distract the driver with unnecessary warnings. Unintended lane departure can have several causes including driver fatigue, impairment, inattention or distraction. Whatever the cause, the consequences can be serious, a frontal collision into oncoming traffic being a common outcome. Lane departure is a factor in a large proportion of accidents involving fatal and/or serious injuries. LDP helps drivers stay in the intended lane of travel by giving a warning if an unintended departure is likely. By considering all of the factors that are likely to influence the effectiveness of its system, Infiniti predicts that, if LDP were fitted to all vehicles, some 12 percent of all road fatalities – around 5000 deaths - could be prevented annually. Extensive road testing was done by Infiniti to determine the proportion of driving situations in which LDP would recognise the lane markers. The system has been available in the US and in Japan for some time, but Infiniti ensured that the system can also recognise the great majority of European lane markers. Track tests were performed to ensure the system gave the required warnings in a wide range of scenarios representing different speeds and accelerations, departure angles, road cambers etc. Driver sensitivity to the warnings given, including the small yaw moment control induced by applying the brakes, was established in laboratory trials.